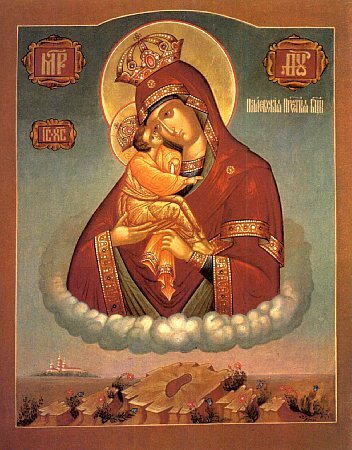 The Pochaev Icon of the Mother of God is among the most venerable sacred items of the Russian Church. It is reknown throughout all the Slavic world: they venerate it in Russia, in Bosnia, Serbia, Bulgaria and other places. Christians also of other confessions come for veneration of the wonderworking image of the MostHoly Mother of God, alongside the Orthodox. At the Pochaev Lavra, an ancient rampart of Orthodoxy, the wonderworking icon has resided about 400 years. (The account about the transfer of the icon to the Pochaev monastery is located under 8 September). The miracles, which issued forth from the holy icon, are numerous and are testified to in the monastery books with the inscriptions of the faithful, who with prayer have met with deliverance from unclean spirits, liberation from captivity, and sinners brought to their senses. The celebration in honour of the Pochaev Icon of the Mother of God on 23 July was established in memory of the deliverance Uspenie-Dormition Lavra monastery from a Turkish siege on 20-23 July 1675. In the Summer of 1675 during the time of the Zbarazhsk War with the Turks, during the reign of the Polish king Jan Sobesski (1674-1696), regiments composed of Tatars under the command of khan Nurredin via Vishnevets fell upon the Pochaev monastery, surrounding it on three sides. The weak monastery walls, just like some of the stone buildings of the monastery, did not offer much defense against a siege. The hegumen Iosif Dobromirsky urged the brethren and laypeople to turn themselves to Heavenly intercessors: to the MostHoly Mother of God and the Monk Job of Pochaev (Comm. 28 October). The monks and the laypeople prayed fervently, prostrating themselves before the wonderworking image of the Mother of God and the reliquary with the relics of the Monk Job. On the morning of 23 July with the rising of the sun, as the Tatars were holding a final meeting about an assault on the monastery, the hegumen ordered the singing of an akathist to the Mother of God. With the first words, "O Queen of the Heavenly Hosts", suddenly there appeared over the church the MostHoly Mother of God Herself, in "an unfurled gleaming-white omophor", with heavenly angels holding unsheathed swords. The Monk Job was beside the Mother of God, bowing to Her and beseeching the defense of the monastery. The Tatars took the heavenly army for an apparition, and in confusion they began to shoot arrows at the MostHoly Mother of God and the Monk Job, but the arrows fell backwards and wounded those who shot them. Terror seized the enemy. In a flight of panic and without looking, they trampled upon and killed each other. The defenders of the monastery attempted pursuit and took many prisoner. Some of the prisoners afterwards accepted the Christian faith and remained at the monastery thereafter. In the year 1721 Pochaev was occupied by Uniates. But even in this difficult time for the Lavra, the monastery chronicle notes 539 miracles from the glorified Orthodox sacred image. During the time of the Uniate rule in the 2nd half of the XVIII Century, for example, the Uniate nobleman count Nicholas Pototski became a benefactor of the Pochaev Lavra through the following miraculous circumstance. Having accused his coachman for overturning the carriage with frenzied horses, the count took out a pistol to shoot him. The coachman, turning towards Pochaev Hill, reached his hands upwards and cried out: "Mother of God, manifest in the Pochaev Icon, save me!" Pototski several times tried to shoot the pistol, which had never let him down, but the weapon misfired. The coachman remained alive. Pototski then immediately set off to the wonderworking icon and decided to devote himself and all his property to the building-up of the monastery. From his wealth was built the Uspenie-Dormition cathedral and buildings for the brethren. The return of Pochaev into the bosom of Orthodoxy in 1832 was marked by the miraculous healing of the blind maiden Anna Akimchukova, who had come on pilgrimage to the holy things together with her 70 year old grandmother, from Kremenets-Podol'sk 200 versts away. In memory of this event, the Volynia archbishop and Lavra archimandrite Innokentii (1832-1840) established weekly on Saturdays the reading of the cathedral akathist before the wonderworking icon. During the time of the rule of the Lavra by archimandrite Agathangel, archbishop of Volynia (1866-1876), there was constructed a separate chapel in the galleries of the Holy Trinity church in memory of the victory over the Tatars, which was dedicated on 23 July 1875.